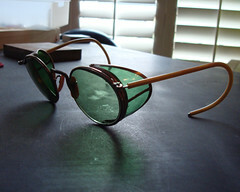 Mid-century Safety Glasses from Chigal.Etsy.com…. I am obsessed with eyeglasses lately…Mostly because I have this corrective lenses RX burning a hole in my pocket…. I think I spent way too much time developing this theory as a 10 year old. But where I come from, appearance is all too important. I have seen it paralyze my mother her entire life. I was there, going through morphine withdrawl (post emergency spine surgery….hospital screwed up my RX so I went from “enough to drug a horse” to raw nerves firing, screaming and all of the craziness that comes with that sort of a chemical snap) vomiting and sweating, dehydrating, severely hypoglycemic and drinking gallons of juice but I kept dropping, my antibiotic IV pump was alarming and my fever was rising…. Unable to take care of myself. I was there, waiting for her to help me up to drive me to the emergency room. I waited for 4 hours while she made herself “presentable”. Thankfully, my dad came home at that point and drove me right to the hospital. An emergency is an emergency is an emergency…. But for her, pruning is her OCD. It is illness, it is dangerous. For now, I have ordered 2 pairs of glasses off of the internet… I’ll report back when they arrive… I just don’t have time to head to the optician/lenscrafters these days….